It isn’t easy to do a good show when you have a poor sound, but that’s what Amon Amarth managed today! The Vikings’ set was very enjoyable to me. Even though I have been a fan of theirs since the release of « With Oden on Our Side » (that has been is my favorite AA album to this day), it was my first time seeing them live and I had a real blast. Hegg’s voice was incredibly powerful and the whole set was flawlessly executed (despite the absence of the band’s historical drummer Fredrik Andersson). The setlist was amazing (there was something for everyone) and the scenery was impressive (drakkar bows, smokes and flames). 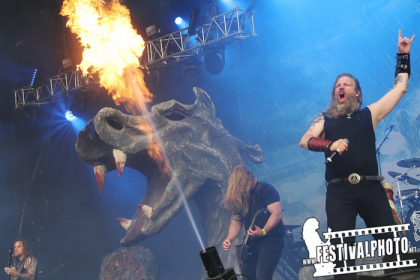 Amon Amarth is a great live band that makes their legions feel alive and strong. An uplifting show!